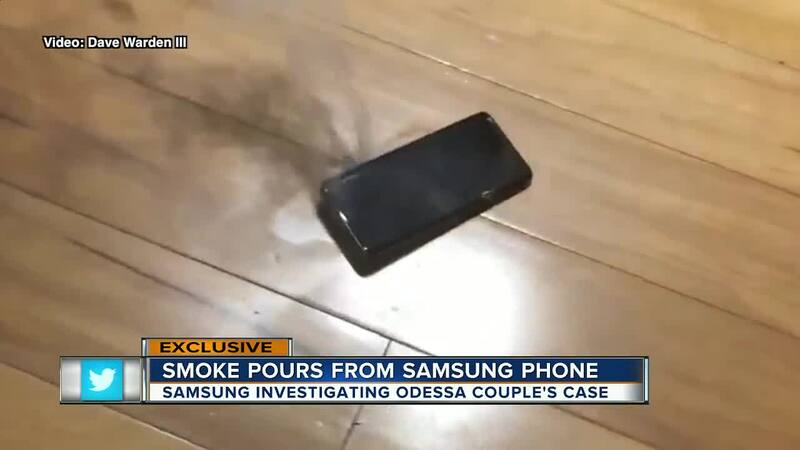 A Central Florida man hit record as his girlfriend's Samsung Galaxy S9 started smoking. Just 24 hours before the phone burst into fire, Pasco County resident Dave Warden III and his girlfriend were on a flight. 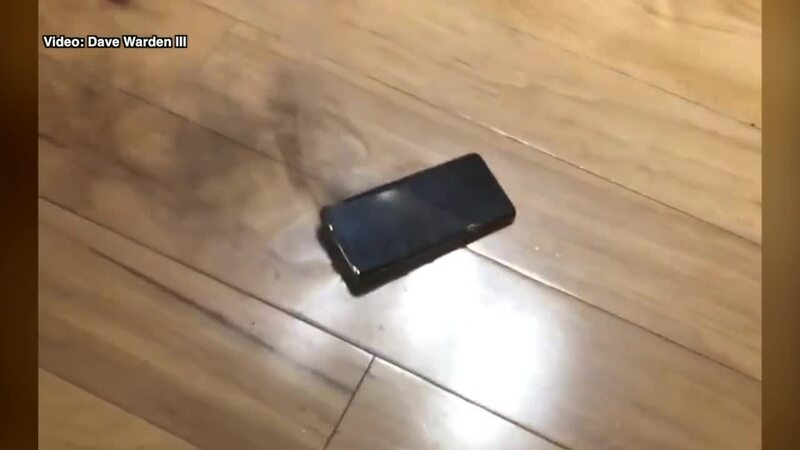 Warden's smoking phone incident could be the first publicly reported case since the Note 7s notorious exploding problems back in 2016. Warden was wrapping up dinner when he looked over and saw the phone starting to smoke on his kitchen counter. "There was popping, cracking, tingling," he said. Soon, he says, the smoke turned to 12-inch high flames. Warden says he made the mistake of grabbing it off the counter attempting to throw the phone into the sink. He missed and the phone landed on the floor. The attempt left Warden with burns to his hands. "It burned for so long that we actually had enough time to grab my phone and actually get video of it burning up," he said. The Note 7 exploding fiasco caused the largest phone recall in history with around 2.5 million Note 7s recalled globally. The phones were banned from flights. It also wiped out billions of dollars in profits for Samsung. An investigation and testing found that the phone's outer casing was too small for the batteries causing them to short-circuit and overheat. Then a couple of months later the replacement phones had the same exploding issues. An investigation into that found the overheating happened from design defects. Samsung took several steps to prevent this from happening again. It formed a battery advisory group made up of academic and research experts. The phone giant also said it would increase its quality assurance processes by including random inspections of suppliers' batteries. While Warden has concerns this could be happening again with the newest models -- Samsung says that's not the case. The company said they have had no other issues with other Galaxy 9s and said no other newer models had any widespread problems whatsoever. The Galaxy S9 was released in March. The Note 8 is also out. They claim Warden and his girlfriend made two big mistakes. First, they threw the phone away. Warden says he regrets doing that. "Maybe we could have done something proactive with that phone that I discarded but that's not going through your head after you watch a device just burn up on the floor. We just wanted it out of our house. We were done with it," he said. Samsung says their second mistake was buying the phone from an unauthorized third party reseller. In this case, an online retailer. The company says it's tough to ensure products will meet their safety standards from an unlicensed source. The company encouraging people to buy from licensed dealers. But Warden insists it's still a Samsung phone and it's the company's responsibility. "You trust the product you are not trusting the company you purchased it from. You are trusting the product and quite frankly it failed," he said. The couple says they bought the phone "lightly used." Warden says the phone was not charging when it burst into flames but the charger they've been using is a standard Samsung charger. Until we called today, Warden says he got nowhere with Samsung. Samsung said they are refunding the cost of the phone and opening an investigation.